Being a coveted firm, we are vividly indulged in the fabrication of a wide range of Mobile Scaffold Towers. These towers are basically used in industrial purposes and are highly efficient in its functionality. As a matter of fact the offered machine is also corrosion resistant and has a longer performance life. 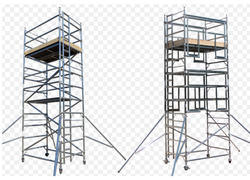 In this range we are offering Standard Mobile Scaffold Tower With Chassis Beams, Mobile Scaffold Tower With Stabilizers, Scaffolding Extension Ladders and Scaffolding Units. We are offering this range in various specifications in order to cater to the varied needs of our customers. We are offering our clients with sturdily constructed Mobile Scaffold Tower with Chassis Beam. These products are designed and developed by our professionals who hold expertise and years of experience in this discipline. Furthermore, they meticulously design these products using required basic material in complete adherence with the defined parameters of the industry and client preferences. 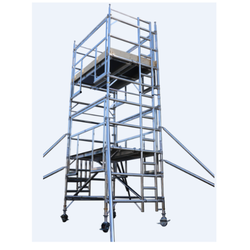 We are one of the leading names engaged offering the best range of Mobile Scaffold Tower. These aforementioned products are fabricated by making use of supreme quality required basic material, procured from the accredited vendors of the markets. Furthermore, to cater to the diversified demands of the clients, we offer this product in different specifications at an economical price. 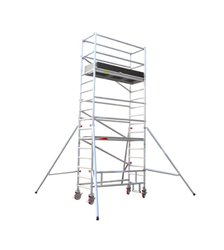 Mobile Scaffold Tower with Cantilever Platform offered are available in widths of 0.75 mm and in lengths of 1.80 m; 2.50 m and 3.00 m as well as allow addition of the extensions to any side and at any height in any combinations as demanded by the customers. We supply these in complete sets where these erected towers allow creation of number of workstations on single scaffold as well as come with 150 kg/m2 of load bearing capacity in event of cantilevers being used in the process. 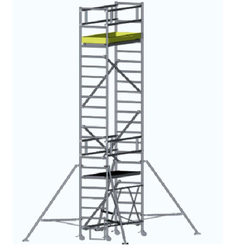 We are offering this exclusive range of best quality Mobile Scaffold Tower with Stabilizers Wide Version. that has become the preferred choice of the clients. Made from certified material, sourced from reliable vendors, this range has been prepared from highly expert with the usage of technically advanced facilities. 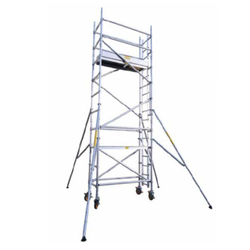 We are a highly reputed and recognized manufacturer and supplier of this high quality range of Aluminum Mobile Scaffold. These treads are TOP stepladder incorporated with extra safety features for the concern of the customer. We have developed this range using best quality raw material. We are acknowledged for offering our clients with the finest range of Mobile Scaffold Chassis Beam Wide Version. With possibility of working heights to be extended from 4.10 m to maximum 13.65 m, these come in 200 kg/m2 loading capacity with the end capacity achieved dependent on size of the platform that is available from 270 kg to max. 810 kg. To meet divergent demands of the clients, we offer these products in different technical specifications. Mobile Scaffold with Chassis Beam Narrow Version offered are made available by us in scaffolding widths of 0.75 m and 1.35 m as well as in scaffolding lengths of 1.80 m, 2.50 m and 3.00 m. These mobile scaffolds are made available in working heights from 4.10 m to maximum 13.65 m with loading capacities of 200 kg / m2 which also depends on platform size from 270 kg to max. 810 kg. Further, the maximum platform heights are limited to 8 m outdoors as well as in 12 m in fully enclosed spaces. We are a prominent name engaged in offering the best Mobile Tower with Chassis Beam. Manufactured by making use high-grade basic material and others, these offered products conform to the defined parameters of the industry. Furthermore, we offer these products in different specifications to cater to divergent demands of the clients. 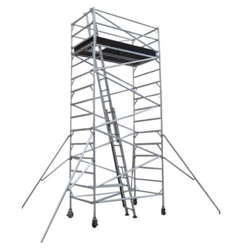 Looking for Mobile Scaffold Towers ?